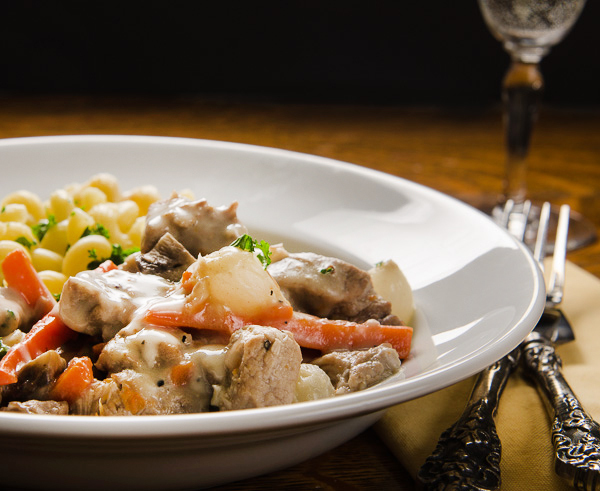 Pork-Mushroom-Wine Stew (aka: Blanquette de Porc). Pork Stew Recipe for the Instant Pot. Photo by my good friend Richard Swearinger. Here’s a pork recipe for the instant pot. This recipe for country-style pork ribs in the Instant Pot is patterned after a French stew known as a blanquette (a white stew). Basically, you cook country-style ribs with wine, chicken stock and vegetables, then add a few finishing touches (including cream—that’s what makes it white) for a stew that’s exactly my kind of French cooking in winter—rich, refined-rustic, and utterly warming for the season. So, what do I think of the Instant Pot? The jury is still out. I’ve only made two recipes in it. While both turned out beautifully, I can’t say they were any better than what I’d make using a conventional braiser. Yes, both recipes might have taken less cook time, but not enough to make me go out and buy a Instant Pot. Still, I’m going to test this big boy out some more and give you my final report. But for now, if you’re looking for French recipes for your Instant Pot, give this one a go! PS: It looks harder than it is—the recipe is long, because I have to put all those Instant Pot instructions in! This is not a “dump everything in the pot and walk away” recipe—but those little finishing steps make all the difference! I guarantee you, they’re worth it. Please do me a favor, however. Read your Instant Pot directions thoroughly—make sure you know how the thing works! 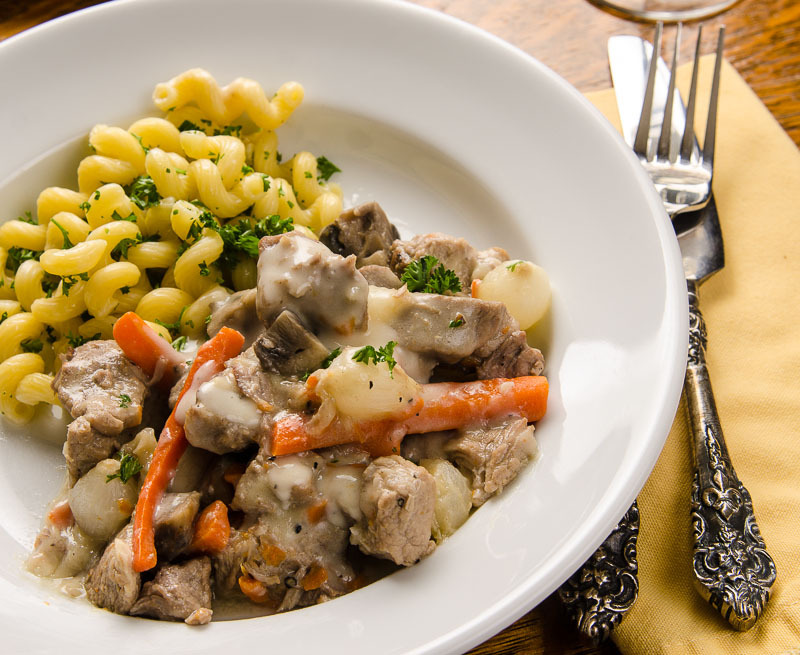 French Pork Stew (Blanquette of Pork) Instant Pot Recipe. Note: This was tested on the six-quart Duo Plus Instant Pot. Serve this with Any-Night Baked Rice hot parsleyed noodles, or whipped potatoes. Pat pork dry with paper towels. Season pork to taste with salt and pepper. Press "saute" the instant pot and set it on the "more" setting. Heat the oil in the inner pot until it shimmers. With the lid off, brown pork in the oil, turning as needed to brown evenly (you'll likely need to do this in batches). If the temperature is too high, reduce the saute level to "normal." Remove all meat from inner pot; drain fat. Add the wine to the inner pot and stir to loosen up browned bits stuck to the bottom; cook, uncovered, allowing wine to reduce slightly. Add the onion quarters, carrot, celery, broth, and bouquet garni to the inner pot. Return the meat to the inner pot; distribute evenly. Press "Cancel" to exit saute mode. Close and lock the lid. Set the valve to "Sealing." Press "Meat-Stew" (on using the Duo Plus Instant Pot). Use the - or + button to set the time to 40 minutes. When the cooking cycle ends, press "Cancel" to turn the pot off. Allow the appliance to cool and release pressure naturally. This will take about 20 minutes. (The little metal float valve on the lid should sink back into the lid, and the lid will unlock). During the 20 minutes that the pressure is being released, prepare the vegetables: In a large saucepan, bring the four cut carrots, the frozen pearl onions, and ¼ cup lightly salted water to boiling; cover and simmer over medium heat for 4 minutes or until just tender. Drain and remove vegetables to a colander. In the same saucepan, heat the 1 tablespoon of butter over medium heat. Cook and stir the button mushrooms in the butter for 2 to 3 minutes or until tender and light brown. Return onions and carrots to the saucepan; set aside. After the pressure has released, remove the lid from the Instant Pot. Drain the pork, reserving the cooking stock. Place pork in a bowl; set aside. Discard other solids, including the bouquet garni. Pour the cooking liquid through a fine-mesh sieve back into the inner pot. You should have about 2 cups. If you have less, add a little more chicken stock. Press "sauté" and adjust heat to "more." As the liquids start to simmer, work the remaining 2 tablespoons butter and the flour together to form a paste. Drop into cooking stock, half a time, cooking and stirring with a wire whisk after each addition until well integrated. Cook and stir until thickened and bubbly; cook and stir 1 minute more; add the cream, stirring with a wire whisk to combine. Reduce the Saute level to "less." Break the meat into 1- to 2-inch pieces. Add the meat to the sauce in the inner pot; add vegetables and lemon juice. Cook and stir very gently to heat through. Serve with hot parsleyed noodles or baked rice. Yes please. P.S. : I’m wondering if you can cook the carrots/pearl onions/mushrooms in the instant pot. It could save you from dirtying another pan. Perhaps stop the pressure cooking about 10 minutes before it’s all done; add the vegetables, and cook for about 10 minutes? Would that work?